This summer, spend time with your elderly loved ones outdoors. There are endless opportunities to get outside and experience the positive influences that the outdoors can provide. Summer offers the perfect opportunity to socialize, exercise, and simply enjoy life. At Brightwater Senior Living, we love the outdoors. 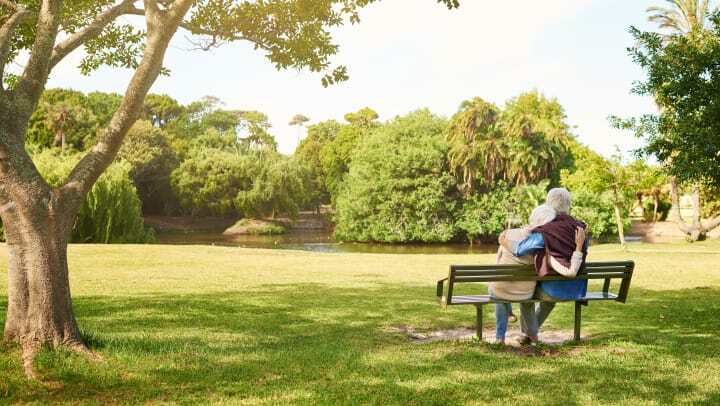 Take a look at our five favorite outdoor activities that can brighten your loved one’s day and keep them active. Summer is a great time to take your loved one to a local sporting event. Whether it is a grandchild’s little league game, a local golf tournament, or a major league baseball game, summertime sporting events can bring back memories of childhood and younger years. Even if it’s not for an entire game, getting into the ballpark and experiencing the atmosphere of America’s favorite pastime can do wonders for a senior’s wellbeing. There are few things that are more refreshing and satisfying than dipping into a pool on a warm summer day. This summer, consider taking a water aerobics class at the local pool. Water exercise is a great way to reduce arthritis and similar joint pains as the buoyancy of the water can take pressure off the joints. Aqua jogging, flutter kicking, leg lifts, and arm curls are all examples of exercises your loved one and their friends can do this summer to help relieve arthritis and joint pain while increasing bone density and muscle mass. For seniors, volunteering can offer the opportunity to stay involved with their passions and focus on the joy that comes with it. Pet therapy has become a popular method of therapy for animal-loving seniors. Not only do cats and dogs offer unconditional love and companionship, research also shows that they have the ability to boost general health and wellbeing. This summer, talk to your loved one about signing up to volunteer at the local animal shelter and watch their face brighten as they play with their favorite furry friends. Plan a picnic with your loved one to experience the tranquility and beauty of the outdoors. This summer activity is the perfect way for seniors to socialize with friends and family and get out of their homes for an afternoon. When you are deciding on your location, be sure to pick a spot with plenty of shade and comfortable seating as summer days can get very warm. If your loved one’s mobility is limited, consider bringing the picnic to them! Courtyards, patios, and mature shade trees can be a great alternative for an easy-access picnic. Spring and summer bring farmers markets full of newly blossomed flowers and farm-fresh produce. Not only are these markets a great place for seniors who love to shop the seasonal offerings, but the exercise that comes with strolling around is a good form of activity without being too straining. This summer activity is the perfect way to support the local community, meet new people, and get the exercise your loved one needs. While seniors should be careful to avoid heavy sun exposure, that doesn’t mean that they need to limit themselves to indoor activities only. Summer is the perfect time to enjoy an afternoon outdoors with family and friends while also providing an opportunity to try something new. For more tips on how to keep the seniors in your life active and healthy, visit our website.